Elise never really knew her parents. Her mum died after her birth and her dad got sick and died of cancer a few years later. Her Uncle Hugh and Aunt Bessie promised to look after her and she has lived with them ever since. She’s been best friends with Franklin for years and they’ve always loved playing games like Knights together. When they start middle school Elise starts to get embarrassed by Franklin and doesn’t want to hang around with him anymore. Then there’s her locker buddy, Amanda who nicknames her Scabula and squashes her lunch every morning. Elise starts to hate school and is afraid to go because of Amanda’s bullying. Just when she needs it a special surprise comes along. Her father leaves her a mystery to unlock and with each discovery a new key arrives. 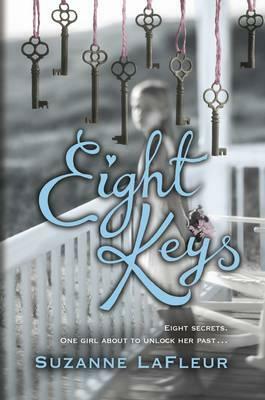 Eight Keys is about a girl discovering who she is and learning about the parents she didn’t know. When Elise is feeling lost and worried, the mystery that her father left for her comes along and helps her choose who she wants to be. It helps her see who her mum and dad were and how much they loved her, even before she was born. You see a real change in Elise, from the worried, confused girl at the start to the confident, happy girl at the end. I really liked the character of Franklin because he’s funny, loyal and will do anything to help his friend. Eight Keys is the perfect book for girls who like Jacqueline Wilson and Cathy Cassidy. It will make you laugh and cry, but leave a smile on your face. Eight Keys would make a great read-aloud for 9-12 year olds, especially as it deals with bullying and friendship.